Browse Pinterest from your menu bar. Is there a better alternative to PinBar Pro for Pinterest? Is PinBar Pro for Pinterest really the best app in Internet Utilities category? Will PinBar Pro for Pinterest work good on macOS 10.13.4? 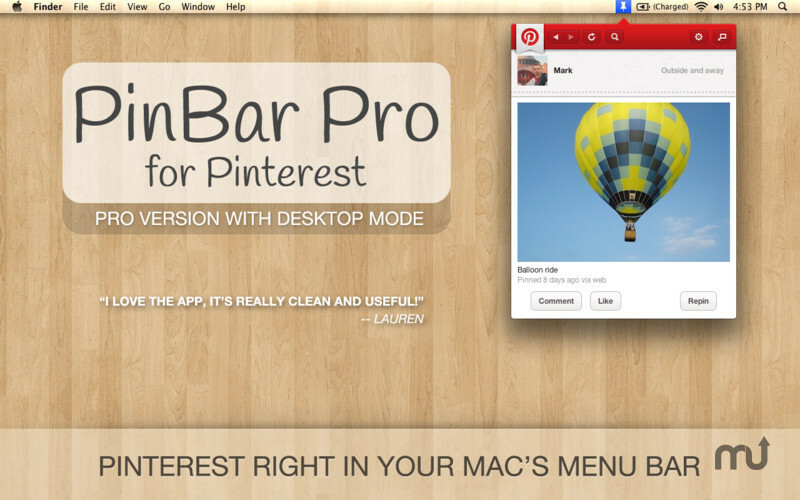 PinBar Pro for Pinterest is a beautiful Pinterest menu bar app. Browse the latest pins right from your Mac's menu bar, see what pinners you follow are up to, and comment/like/repin all from PinBar's unobtrusive menu bar window. With PinBar's unique Zoom feature you can see any pin at its full size without any distractions. Give it a try yourself. The "Clear Distractions" mode now works again. PinBar Pro for Pinterest needs a rating. Be the first to rate this app and get the discussion started! PinBar is an independent app and not affiliated with Pinterest.